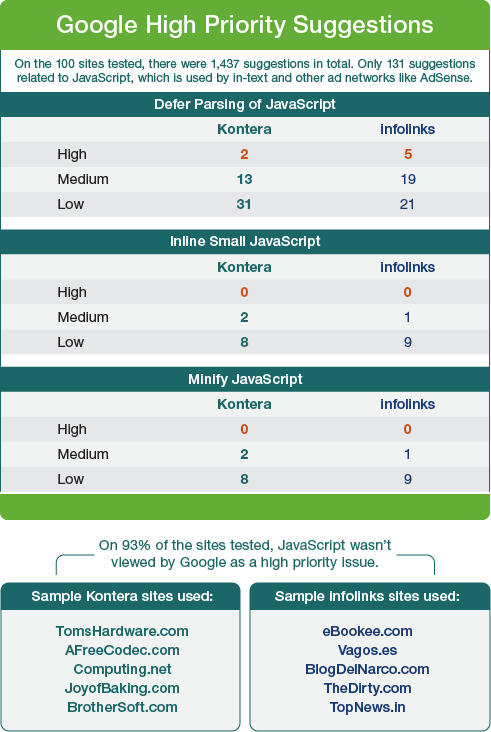 Study: Does Kontera affect your Google Search Engine Rankings? It’s no secret that it’s been a pretty stressful year for website publishers. When Google released their Panda update back in March, many sites lost as much as half of their organic traffic overnight, without any idea what they were doing wrong. In the last 9 months we’ve learned a lot about post Panda SEO, but one area that continues to be misunderstood is the issue of page speed, specifically as it relates to In-Text advertising. Recently my friend John Chow published a post making the claim that the in-text network Infolinks will help your page rank, while using Kontera will hurt your page rank. Not sure how two in-text networks could produce such wildly different results; I decided to replicate John’s data on a larger scale and do some additional research. Using Google’s official Speed Test Tool, which assigns each website a speed score and reveals what elements of a page are slowing down your site, I tested 100 sites that use either Infolinks or Kontera. – According to Google’s Matt Cutts, Page Speed only seriously factors into page rank for 1 in 1,000 websites. – At least 93% of the time in-text advertising has no effect on Page Speed score. 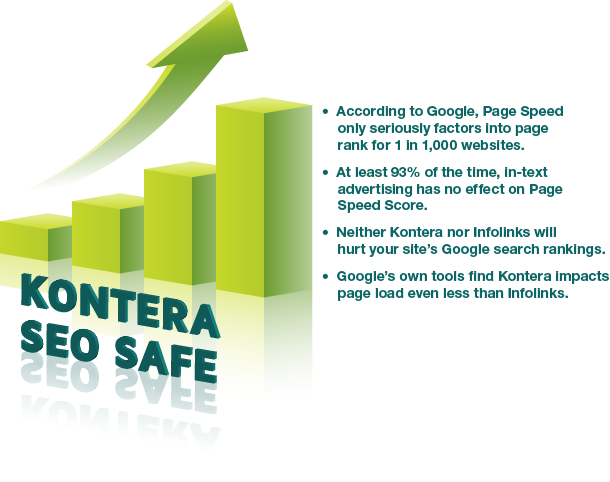 – Neither Kontera nor Infolinks will hurt your site’s Google search rankings. I took the top 50 sites on Infolinks according to Alexa.com Rank and compared their Google Speed Test Tool scores against 50 top sites using Kontera. Google’s Page Speed Score indicates how much faster a site could be, so the closer a page is to 100, the closer it to being fully optimized. With that in mind, the Kontera sites averaged a test score of 84.7 while the Infolinks sites actually had a slightly lower average score at 81.8. Additionally, I reviewed all of the specific suggestions that could relate to in-text advertising to understand the impact of the code. The Google Speed Test Tool offers specific suggestions on how to improve your page speed, and then ranks them by priority. High Priority suggestions represent the largest potential performance improvements relative to the least development effort. Medium Priority suggestions will either have less impact or will take more development work. Low Priority tips will have little to no impact on your page speed and should only be tackled when you’ve addressed absolutely everything else. When John did his original post, he did an apple to orange comparison between his web-monetization and SEO website, which uses Infolinks, and Gayot.com, a restaurant guide and culinary reviews website that uses Kontera. While the end scores are not that far apart, John Chow’s website scores an 86 on the Google Speed test compared to a 72 for Gayot.com; John then proclaimed that Infolinks is 50 times faster than Kontera. If In-Text isn’t hurting your Page Speed, what is slowing your site? All of these tips are easy to implement and are clearly viewed by Google as much more important to improving your page speed. The Google Speed Test Tool is a great resource, and I fully recommend utilizing it for more tips on what you can do to optimize your own website. “…One thing to bear in mind, however, is that only something like 1 out of 100 searches is site speed such a factor that it would actually change the rankings to a noticeable degree. 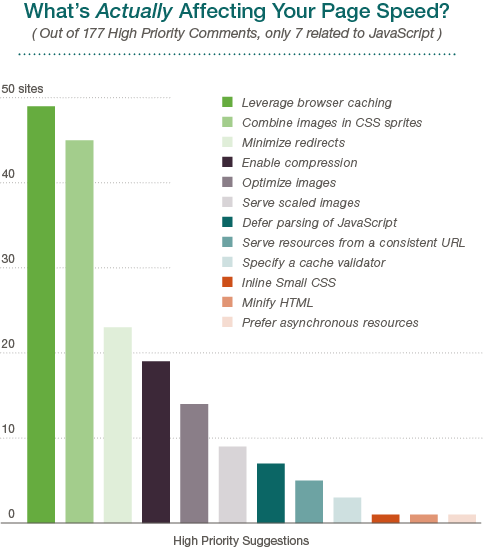 Again, only 0.1% of sites (1 in every 1,000) actually have a significant page speed problem. This means that if you follow even the bare minimum best practices for publishers regarding page speed, your search rankings will remain unaffected. As Matt said, page speed is still very important for things like user experience and conversion rates, but in terms of page rank, it’s not going to make a difference one way or the other. Additionally, Kontera and most in-text networks only start loading on a page after everything else, meaning nothing is compromised from a user experience perspective. After examining all the evidence, I can confidently say that Kontera is NOT going to affect your Google page rank. Infolinks appears to be slightly slower, but neither Infolinks nor likely any other in-text advertising network will impact your Google page rank. Matt Cutts made it clear that page speed is only going to factor into page rank in extreme cases. Our own study validates this and indicates that even if in-text minimally impacts your page speed score, it happens only a very small percentage of the time. Disclosure: My firm, Influence People, does blogger relations for INTENTclick, which is a Kontera Network. John Chow has a similar business relationship with Infolinks.